Born between 1470-75 on Lake Garda in Desenzano, Italy, the young Angela grew up in a loving family where she imitated saints. She worked hard in the family vineyard and farm. She was called early to commit herself to the Franciscan Third Order, in part to be able to receive more frequent Eucharist. She suffered the deaths of her beloved sister, both parents and a dear companion at a young age. During a harvest work break in the fields, she beheld a vision where heaven opened and angels and virgins traveled via ladder between heaven and earth. She recognized one of the virgins as her beloved sister (in other versions it was her dear companion), who told Angela that God wanted her to found a company of virgins in a new kind of community where they would remain in their homes and workplace, without habit, solemn vows or enclosure. Their call was to religiously educate poor girls. In this image, St. Angela holds the symbol of St. Ursula, in whose name she founded the company. The arrow was a symbol of St Ursula’s martyrdom. 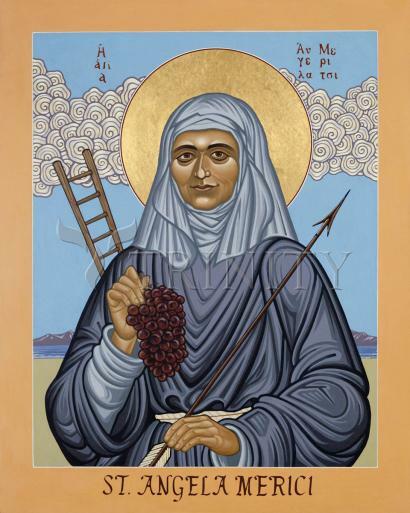 The grapes are symbolic of the eucharistic blood of Christ, so important to Angela, and also of her family’s vineyard. Even more, it is symbolic of the cluster of women she drew together in this unique way. Lake Garda is the setting. She died in her home at St. Afra’s church in Brescia, Jan. 27, 1540. Angela was a Franciscan tertiary at age 15. She received a vision telling her she would inspire devout women in their vocation. As our Savior says: "A good tree is not able to produce bad fruit." Mothers of children, even if they have a thousand, carry each and every one fixed in their hearts, and because of the strength of their love they do not forget any of them. In fact, it seems that the more children they have the more their love and care for each one is increased. Be sincerely kind to every one according to the words of our Lord: "Learn of me, for I am meek and humble of heart." Thus you are imitating God, of whom it is said: "He has disposed all things pleasantly." And again Jesus said: "My yoke is easy and my burden light."